Julie Balzer - Not only is this girl hysterically funny (oh, how I love dry humor! ), but her ability to help you step outside of your artistic comfort zone is perhaps one of her best qualities. Julie has a way of putting into words what is "missing" from your artwork in a way I haven't been able to grasp...until now. As she said, "once you can articulate what is missing from your art, you can fix the problem." Julie drove home the need for open and clear communication. Not only is that a benefit when you're creating art and developing your own style, but it's vitally important with all relationships. The need to clearly articulate will stay with me for a lifetime. Cheryl Boglioli - I met Cheryl almost five years ago, when I was working at a scrapbook store, and I liked her immediately. She's a wonderful instructor and has a great presence so I was excited when she offered to come and teach for eP...just a few months after I purchased the online store. I rented a table space at a friend's studio and Cheryl taught two packed classes, where we explored Pan Pastels and encaustic wax. I again had a lovely time learning from Cheryl. I adore her sense of artistic adventure and the fact that she'll dive into any medium, becoming an expert who can then effectively teach others. Stayce DeWid - Stayce is a barrel full of fun and the photo above (Stayce is in the far left) shows the very first class I had at the studio. Stayce was going to be in the New England area and was looking for some teaching spots. Her being available to teach meant I had to get the entire studio set up in two weeks. Oh man, what a whirlwind! It was so worth it! 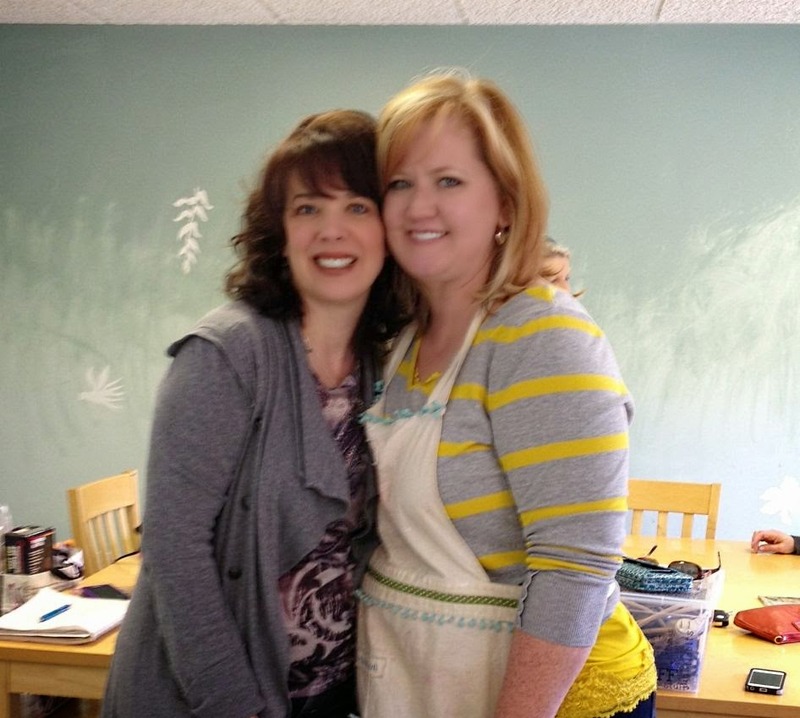 I needed the push to get busy with decorating the new space and spending an afternoon with Stayce was a blast! 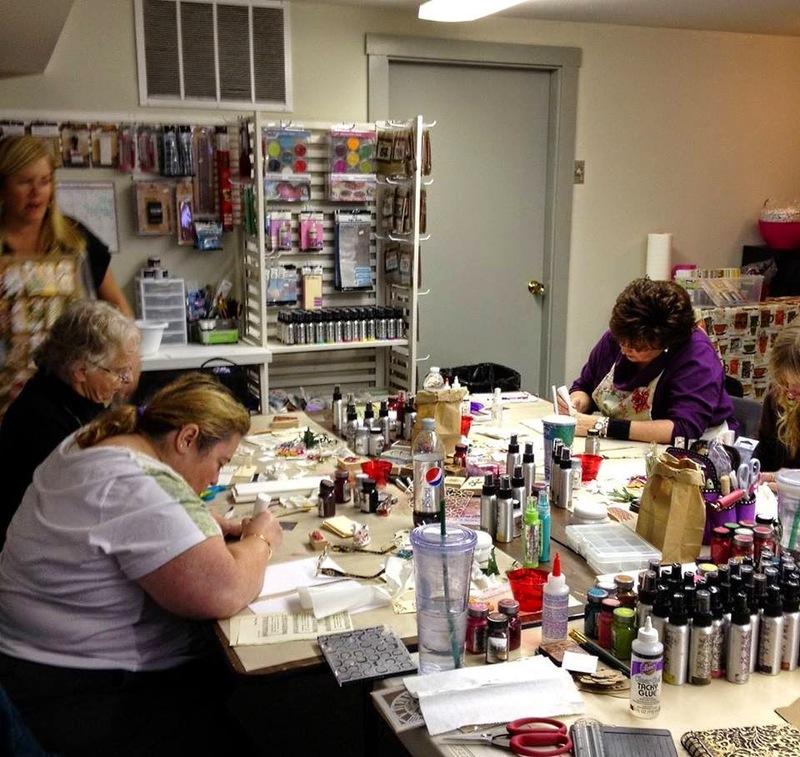 Stayce has a fabulous product line, I adore Art Anthology products, is wildly creative, and a great teacher. I also love that I can freely call her "cupcake..."
Catherine Scanlon - I'm not sure how it's possible but I have no photos of Catherine teaching in the studio so I'll share just one of her beautiful pieces of art. I think I got Catherine's name through a friend of a friend...or something like that...and I'm so glad that I've had the opportunity to not only learn from her but to also watch her teach (and see her design her own line of stamps and stencils!). Her Gelli Plate class stands out as one of my favorite classes, where I somehow managed to create almost 30 art journal backgrounds in a day! Catherine is an accomplished designer - her drawings are stunning - and an all around delightful individual to spend time with. She has a wonderful witty charm, while being down to earth and approachable. Catherine has just opened a small art studio in ME so if you're in the area, look her up! 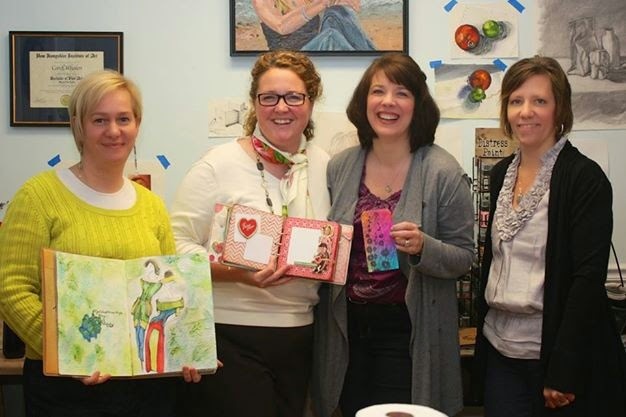 Opening of the first studio space (with Donna Marie Cecere, Laurel McNeil, & Julie Masse) - This seems like so long ago... When I first decided to try and see if a studio would be successful, a sweet friend of mine offered to let me share her small studio space and a number of wonderful friends came out in support of that first opening. 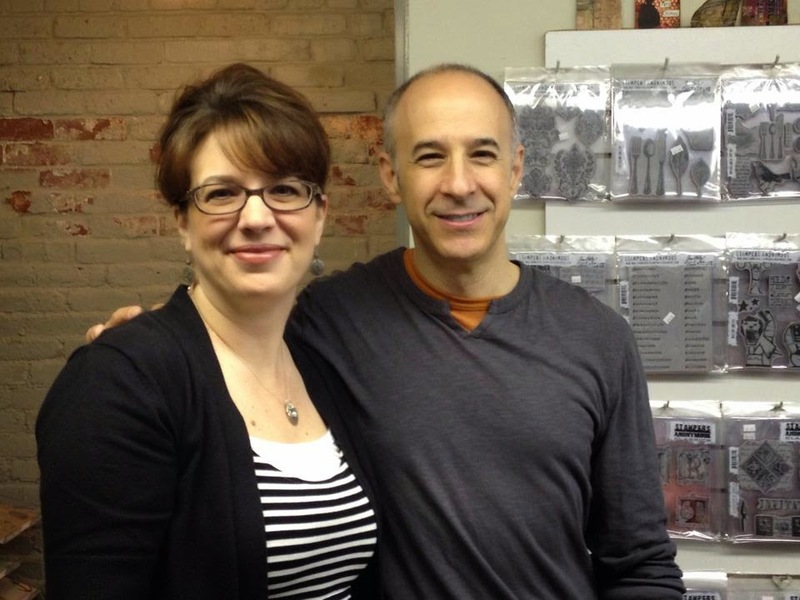 Donna Marie Cecere was on our original design team and she was a valuable asset to the group. Not only is she a stunning clothing designer and paper artist, but she spend many hours listening to me "air my grievances" about the stresses of store ownership. She also has a wonderfully creative mind that was a great inspiration. Laurel McNeil is the sweetest thing out there and was so helpful in promoting not only the grand opening (at both locations), but also spreading the word about our classes. She's also been a wonderful business resource and a great help with many questions. 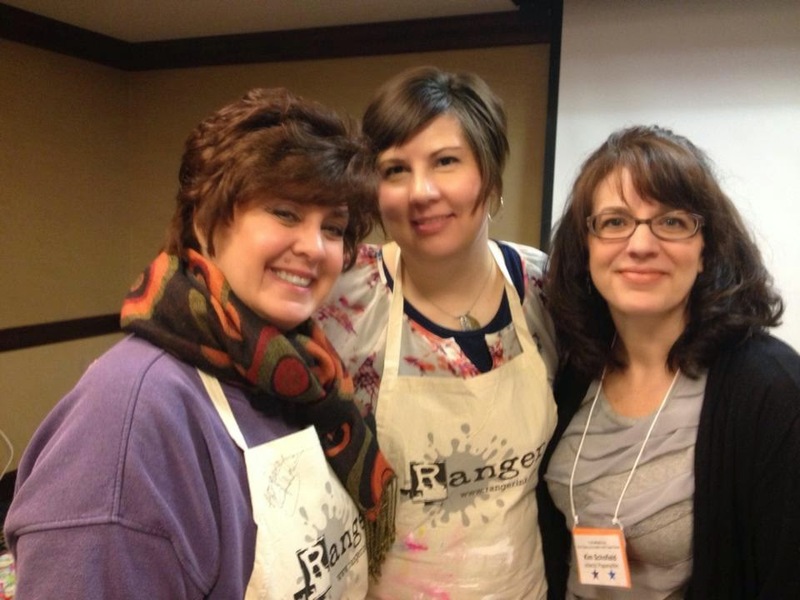 Laurel manages the New England Paper Crafts blog so head on over and say hi! And, my dear friend Julie. In addition to running her household, teaching her five sweet kiddos, and designing she also agreed to take care of the product uploading so that I could take a break from my many hours on the computer. (And the product uploading was torture...LOL!) I never could have managed without her initial help and support. A HUGE thank you goes out to these wonderful three ladies!! Kit of the Month - (run by Mary-Ann Maldonado) - My sweet, ever bubbly friend Mary-Ann (shown on the left). 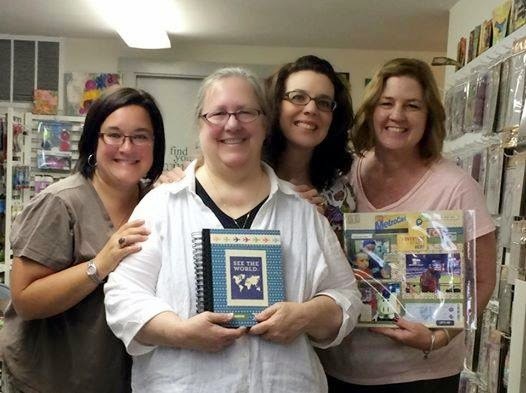 Keeper of all things scrappy, who learned how to integrate "getting dirty" (well, she never got that dirty) into scrapbooking, and ran the most fun Kit of the Month evah! We all had so much fun with this girlie that we're now invading her house every month to create! Mary-Ann makes the most beautiful scrapbook pages on the planet and I can't wait to have more free time to just hang out and craft with her (and all the girlies!) Thank you for all the wonderful breakfast break, for helping with all those kits, and for getting my Beanie boy to stop chewing his fingernails. Nancy Lefko - Yet another amazing teacher and no photo! I need to fix that! 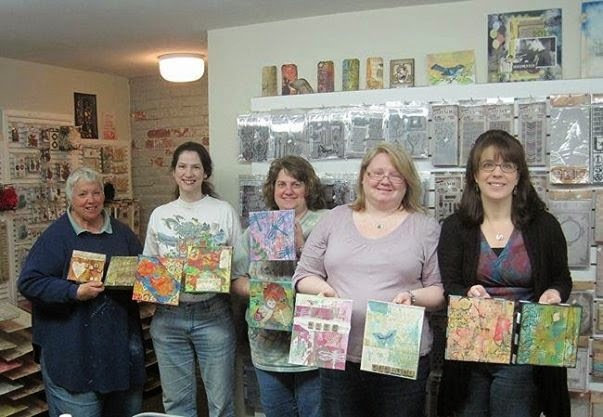 However, here are a few of us at the end of one of her classes, showing off our canvases. Nancy was another recommendation from a friend, maybe Laurel, and I'm so glad that we made a connection. Nancy taught a number of classes at the store and not only do I love her art but I love how easy she makes creating. 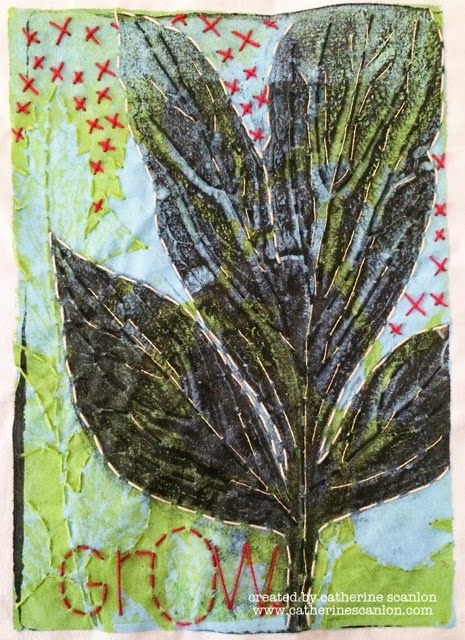 I don't normally do well with collage art, but Nancy did such a great job of breaking down the creation of her pieces into easy steps that by the end of the class I had a much better understanding of how to develop a foundation for my art. I loved the final results and thoroughly enjoyed getting to know Nancy. Seth Apter - You know what I have to say about Seth Apter? I love this guy...Loved having him in the store, loved indulging in a sushi night (yes, there is amazing sushi to be found in NH) with him, and loved taking his 52-card pick up class! Seth and I connected months before he ever made the journey to NH and right away I thought, "I like this guy..." He's witty, down to earth, and genuine. He has a style that is all his own and I love how he's transitioned from a "non-art" career to making art for a living...how cool is that?! And, of course, he's from NY so he's got that going for him. **giggle** If you have the opportunity, take a class with Seth, you won't regret it! Donna Downey - Meeting Donna was a serious highlight for me. I love her style, but more importantly I love that she takes risks, tries crazy combinations of colors and textures, and doesn't take herself too seriously. Watching Donna's Inspiration Wednesday videos (they're coming back in 2015!!) made me realize that I could just be myself in my own videos. I make so many mistakes that sometimes it's frustrating, but the truth is that being a bit "flakey" is who I am in real life (sorry, kids!) so I made the decision to just be myself...and boy have I had so much more fun! So, thank you Donna for helping me to just go with the flow! As I close today's post, I have to also mention many others that have been so special and supportive over the past few years. (I just don't have photos!) Our DT Manager, Bonnie Irvine, has been such an important part of our team. Not only did she spend countless hours uploading products into the store, while always looking for ways to improve the function or layout, but she also did a tremendous job of managing our design team. Bonnie helped to write blog posts, keep everyone on track, kept communication lines open within the team, found guest designers, gave advice, and listened for many hours when I'd call her late at night to gab. And she even surprised me with lovely little pieces of her own art for the studio (that's so special!) The only downside to Bonnie is that she doesn't live next door...seriously, I've asked her to move to NH...like a lot. The rest of the design team have been so amazing! A HUGE thank you to Sherry Cheever, for totally understands this industry and was someone I could email or call and knew she would totally undersstand the frustrations, for Micki Harper, who sent me her very first face painting (oh, how I LOVE it!) and always inspired me with her ongoing quest for learning and practice. Broni Holcombe who has an wonderful talent for weaving together clean and simple with mixed media, Adriana Templeton, who besides being a great designer is a blast and always sent me fun and silly emails. Sue Lelli, an ongoing source of encouragement and artistic inspiration and Sue Carrington, whose artwork always blows me away. Even to our newest members...Julia Aston, who I've known for many years, decided to jump into mixed media with both feet and has continued to amaze me with her design talents and Steph Ackerman, who participated in many of our challenges, was a guest designer, and delighted us with her artwork. Karen Crossen who makes the most amazing things with paper and paint, Toni Burrows, another darling and super talented designer, who consistently wow'd me with her art. Ladies, you are all talented artists and have been a wonderful and supportive team! Your art and blogs have been such an encouragement and help, not only to me personally, but to this business and industry. I am forever grateful for the time we've been able to spend together on this team. In closing, I need to also thank my precious family. My husband has been my biggest supporter and source of encouragement. He has helped me from the first day of store ownership; helping me to pack and ship to caring for our boys so I could work, has taken on extra work so I have more freedom to follow this crazy dream, has done all the heavy lifting at the studio and spent many hours setting things up, painting, moving, etc. I couldn't ask for a better partner. And my sweet boys, who have never complained about all the time that I'm away from home or working on the business. They have kept me company at the store, have helped carry boxes, and understood when I needed to finish "one more thing." It is because of them that I made the decision to close, so I can now give more back to them. They are the greatest earthly blessing God has given to me...they are the most precious gift and I don't want to miss another minute of time with them. Thank you to everyone who has been a part of this journey (I'm sure I've missed people, please forgive me)...it has been a great ride and I'm thankful that I had an opportunity to have this experience. Thank you to Daisy Sparks for creating a great customer base and thank you to all of our amazing, loyal customers who have not only kept eP afloat over many years, but has helped in making the business grow and prosper over the past two and a half years. I will miss all those emails and seeing your smiling faces in the studio each week. You are a biggest reason that I adore this industry...the collective group of designers and customers really have been my greatest joy! What a wonderful post. I will miss coming back to the shop...but I know that I will see you in NYC! Thanks for making my time at eclectic Paperie so special. what a lovely post Kim - How nice to have all these wonderful memories of people and events - sad and happy at the same time - I appreciate that you had faith enough in me to invite me to be on your team - and I have enjoyed working with all the wonderfully talented people on it! Kim your post is wonderful, so special , so heartfelt, so you ! It was through Eclectic Paperie I began to spread my wings, the work of the people on your team your visitors... just so inspirational you've all become such a part of me... THANK YOU for all that you have shared with all of us; your time, your talent, your friends/family and your passion. God Bless you ! What a wonderful, heartfelt post. I'm sure your closing is bittersweet, but you have memories, friendships, artwork, and your own personal and artistic growth to take away from the experience. It was MY pleasure to meet you & to teach at your store. I loved every minute there! I wish you many fun days ahead with your boys. a MILLION THANKS for your support! I just love you girl. So glad we are close and can still meet and create. You are an inspiration and I thank you for bring such a clean, neat girl into the dark side. Well, to the semi-dark side. Thank you for everything. Such a heartfelt post. I am so happy to read about your great adventures through eclectic Paperie. eP Nation (customers) are truly loyal and simply the best. You really took eP to the next level and made it even better. Enjoy your time with your growing boys. That season goes so fast and is so precious. Make some great moments. Thank you, Kim, for an awesome and final eP chapter. What a beautiful post, Kim. You've been on quite the journey! Lovely seeing all those smiling faces. Have fun with your fellas, I know you will. You have some great memories to hold on to. I have thoroughly enjoyed each post. Thank you and may you be blessed in whatever you do! Your post is so sweet! Thank you for including me. I was so sad to hear that you were closing BUT i've been there and totally understand. Your post brought tears to my eyes, Kim! So MANY lovely memories and people you have crossed paths with. Being on the eP team is definitely the HIGHLIGHT of my crafty "career." Though I will definitely MISS eP, I will forever be grateful for the opportunity. Wishing you and your family nothing but the BEST ~ just like YOU! I was a guest designer of eP.